When the light blue Levi Patina touches the Deepest Darkest Blue a beautiful aura around the spot takes form. 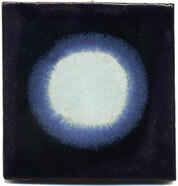 Temperatures nearing 2,000 degrees kindle chemical reactions between ceramic glazes, creating halo effects, revealing new colors, and evoking an otherworldly mood. No two Cosmic Spots are alike.